If you’re not reaching, engaging, and monetizing customers on mobile, you’re likely losing them to someone else. Register now for the 8th annual MobileBeat, July 13-14, where the best and brightest will be exploring the latest strategies and tactics in the mobile space. Almost two years after launching on iOS, Birchbox has finally brought its beauty and grooming e-commerce service to Android. Founded out of New York in 2010, Birchbox was one of a long line of “things in a box” services that dispatches a curated set of “stuff” each month to their members. In Birchbox’s case, it specialized in beauty products for men and women. The company has raised north of $70 million in funding to date, including a whopping $60 million last April. But Birchbox has evolved beyond its box-based subscription service into a broader beauty product retailer, something that its iPhone app has helped support. Perhaps one of the most surprising facets of a company that has been operating as long as Birchbox is that it has hitherto not embraced Android with a dedicated mobile app. However, buoyed by a growing consumer shift to mobile, it seems Birchbox has finally caved. The company says the launch was “driven directly by customer demand and high organic customer engagement” with its iPhone app. Launched back in October 2013, Birchbox sought to shake-off its “beauty-in-a-box” reputation by focusing on a fully-fledged e-commerce experience — there was no way to buy or update subscriptions through the app. It was all about speedy shopping and two-tap checkouts. 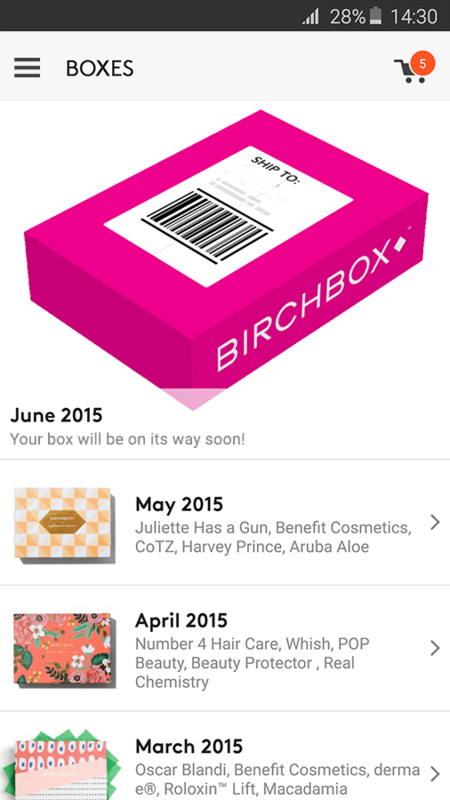 However, earlier this year, Birchbox finally opened its iPhone app upp for subscription box purchases too. By broadening its horizons, business grew, with average order values, order frequency, conversion rates, and other key metrics each seeing a significant boost. The company says that its “full-size” product revenue from mobile grew by 236 percent between 2013 and 2014. Interestingly, the company says that almost half (46 percent) of the app’s users are not Birchbox subscribers — so in effect the app serves a whole new lucrative market. Moreover, Birchbox says that more than a third of Birchbox’s “shop” revenue (as opposed to subscriptions) now comes from mobile. The company says that it has seen a surge in visitors to its mobile website from Android over the past year, with almost a third (30 percent) of all visitors browsing from an Android device. So a native mobile app more than makes sense. Though Birchbox is available in other markets (France, U.K., Spain, Belgium, and Canada) the mobile apps remain a U.S.-only affair. So with plenty of cash in the bank, the company will be looking to expand its mobile-based beauty emporium to other countries too, kicking off in in the next few months. VB's research team is studying mobile user acquisition... Chime in here, and we’ll share the results.